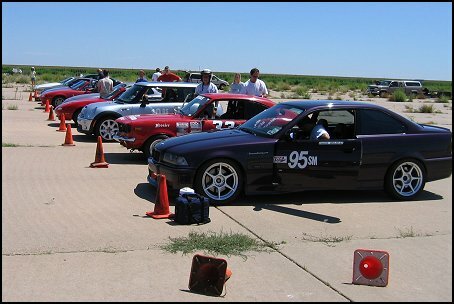 This was one of the best West Texas Region events for 2004. There was no wind, the temps were good, the course setup was great (even though we could only use half of our usual area at Miller Field), registration ran smoothly, the event started on time and there were no delays throughout the day. The event was done in a special format to simulate a 2-day event... 4 runs on the course in one direction, then 4 runs in the other direction, and your best time from each side was added together for your final result. The only modification I had done to the car before this event was adding an additional 0.5 degrees of negative camber up front (finally!) using '96+ M3 upper strut bearing plates swapped left to right. With the additional negative camber, the M3 felt awesome on the street, but I was excited to see how it would do at this event. We had several people from the Rio Grande Region come over for this event, including Paul Brown ('93 Toyota MR2 in E-Stock) who has claimed several trophies at the National Solo2 and ProSolo Championships over the years (in other words... he's really good! ). I didn't really think I'd have much of a chance getting first place Overall with Paul there, so my main concern was to see how I'd fair against my regular competition, Steve Sucsy ('00 Honda S2000 in B-Stock), with the latest camber modification. 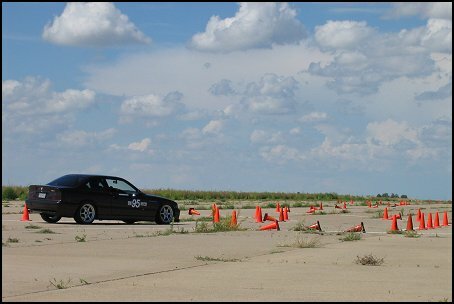 The car felt absoultely perfect on the course and I was able to put down some really fast times. I was even able to get Fastest Time of the Day. In the past, I've really struggled to get within a few tenth's of Steve's PAX times, but at this event I was able to run faster on both courses to take 2nd place Overall behind Paul Brown. I still had to run my best in order to get those faster times, but the additional negative camber made it a little easier. I'm definitely very happy with the handling capabilities of the M3 at this point, especially considering that it is "mildly" prepared by competitive autocrossing standards. With the points I acquired at this event, I'm back in third place in the Championship standings, and as long as I'm able to do good at the last three events, I should be able to win the 2004 Championship. Let's hope nothing goes wrong!